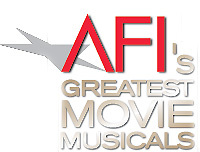 The American Film Institute (AFI) in Los Angeles, California conducted its 2006 polling on the Greatest Movie Musicals of All Time, to highlight the 25 Greatest Movie Musicals of All Time. See also this site's informative sections on Greatest Musical Song/Dance Movie Moments and Scenes (illustrated) and the genre of Film Musicals with a listing of the Top Film Musicals of All Time. A ballot was distributed in 2006 with 180 nominated musicals to a jury of over 500 leaders from the creative community, including composers, musicians, film artists (directors, screenwriters, actors, editors and cinematographers), critics and historians. Due to the extensive number of memorable movie musicals in American film, jurors were also allowed to write in votes for musicals that did not already appear on the ballot. MUSICAL - A feature-length American film* in which music and lyrics significantly advance the plot, develop character or are otherwise integral to the film narrative. *AFI defines an American film as an English language motion picture with significant creative and/or financial production elements from the United States. AFI defines a feature-length film as a motion picture of narrative format that is typically over 60 minutes in length. HISTORICAL SIGNIFICANCE - Musicals that have left an indelible mark on the history of the moving image - through innovation in song and dance, visionary narrative devices or other groundbreakingachievements. CREATIVE IMPACT - Musicals with songs that evoke the memory of its film source, thus ensuring and enlivening both the music and the movie's historical legacy. LEGACY - Musicals that continue to inspire artists and audiences alike. This musical set in Hollywood during the conversion from silent to sound films has Kelly singing, dancing and splashing in puddles. Reynolds and O'Connor lend support in some of the most delightful song and dance numbers ever filmed. Garland's Dorothy Gale is transported from her black-and-white Kansas home to the colorful land of Oz via tornado. From here she journeys down the Yellow Brick Road and is helped by a Scarecrow, a Tin Man, and a Cowardly Lion on their way to see the Wizard. The Harold Arlen/E.Y. Harburg score is highlighted by "Somewhere Over the Rainbow." Andrews is Maria, a nun who becomes governess to the Von Trapp family in this film adaptation of the Rodgers and Hammerstein Broadway musical. Maria falls in love with the children and their handsome widowed father just as Austria is being annexed by the Nazis. The film's songs include the title song, "Do-Re-Mi" and "Climb Every Mountain." This supercalifragilisticexpialidocious musical fantasy introduced Andrews to film history as the magical nanny who at arrives at the home of Jane and Michael Banks via umbrella and teaches them that a spoonful of sugar helps the medicine go down. Garland's comeback performance highlighted this remake of the 1937 film in which a young film star's rise to fame coincides with the decline of her once famous, alcoholic husband. Professor Henry Higgins bets he can turn a flower girl into a lady just by teaching her to speak properly. Based on George Bernard Shaw's Pygmalion, Lerner and Loewe's celebrated Broadway musical comes to the screen with Hepburn celebrating her transformation with "The rain in Spain, stays mainly in the plain!" Kelly and Caron fall in love to the tunes of Gershwin - "I Got Rhythm," "Our Love Is Here To Stay" and "S'Wonderful" - in postwar Paris. The film's legendary finale, the 17-minute ballet, was both daring and innovative in 1951. Minnelli's nostalgic musical picture-post card follows the lives of the Smith Family in four seasonal vignettes as they wait for the 1904 World's Fair. Garland's enduring renditions of "The Trolley Song" and "Have Yourself a Merry Little Christmas" are just two of the film's many memorable songs. The East and West collide in Rodgers and Hammerstein's musical based on the true story of a 19th century English school teacher who teaches the children of the very stubborn, yet forward thinking, King of Siam. Getting to know each other is a hard- earned lesson, etc, etc, etc! A razzle-dazzle song and dance extravaganza based on the Broadway musical. A couple of murderesses get away with the crime and claw their way to celebrity in 1920s Chicago...and all that jazz! This quintessential backstage musical stars Keeler as the girl whose career begins when she stands in for the leading lady ("You're going out there a youngster, but you've got to come back a star! "), and saves the show from closing. It was the first film to feature choreographer Busby Berkeley's dizzying overhead shots of dancers in kaleidoscopic patterns. This is Fosse's semi-autobiographical, highly stylized musical of a pill-popping director/choreographer torn between too many women and "Death," beautifully embodied by Lange. "It's showtime, folks." This was the first original screenplay specifically written for Rogers and Astaire, who "meet cute" in a London hotel and dance along the canals of Venice. The film contains some of Irving Berlin's most memorable hits, "Cheek to Cheek" and "Isn't This a Lovely Day to Be Caught in the Rain?" Streisand, in her film debut, is Fanny Brice, legendary vaudeville comedienne whose career blossoms as her personal life falls apart. Adapted from the hit Broadway musical, Streisand wowed audiences as she chased after Nicky Arnstein singing "Don't Rain on My Parade" and lamented his loss with Brice's iconic "My Man." Film actor Astaire is washed up in Hollywood and heads to New York to resurrect his career, this time on Broadway. With enduring standards like "That's Entertainment" and "Dancing In The Dark", Comden and Green take a light-hearted look at how an ill-fated concept, an updated Oedipus, becomes a musical smash. Cagney sings and dances his way through the patriotic songs George M. Cohan composed in the early years of American vaudeville and musical theatre. Songs like "Over There", "It's A Grand Old Flag" and "Yankee Doodle Dandy" inspired generations when the world was at war. A trio of sailors on leave in New York City romance three females during a triple date to the Empire State Building, in this exhilarating on-location musical directed by Stanley Donen and hoofer/star Kelly, featuring Leonard Bernstein's "New York, New York." A love poem to the 1950s, this nostalgic musical follows the exploits of seniors at Rydell High - particularly Newton-John's Sandy, an innocent teenager who falls in love with Travolta's Danny, a greaser from the wrong side of the tracks. Based on the Broadway musical, the film's songs include "Hopelessly Devoted to You" and "Summer Nights." Marriage is in the works for eldest son Keel (for Jane Powell) and his six younger brothers, amidst amazing athleticized choreography. This animated musical is based on the classic fairy tale of the girl who is trapped in the castle of a hideous beast but eventually falls for his unusual charm. The film's musical highlights include the title song and the show-stopping "Be Our Guest." Joseph L. Mankiewicz's romantic musical was a tale of two gamblers, Sinatra's Nathan Detroit and Brando's Sky Masterson (in a musical?) who bet on the chances of romance between Sky and local prim missionary Jean Simmons. James Whale's original, classic black-and-white version of the 1927 Oscar Hammerstein-Jerome Kern musical set in rural Mississippi River towns, with the inimitable performance of Paul Robeson as Joe singing "Ol' Man River." Set in late 19th century Paris, Luhrmann's striking fantasy is a reinvention of the Hollywood musical. Kidman is a consumptive nightclub singer, desired by the world's most wealthy suitors, but it is struggling writer McGregor whom she loves. Some of the greatest American standards are sung by Kidman and McGregor.